The Sephora Beauty Insiders Sweepstakes is open only to legal residents of the fifty (50) United States (including the District of Columbia) and Canada who are at least eighteen (18) years old. 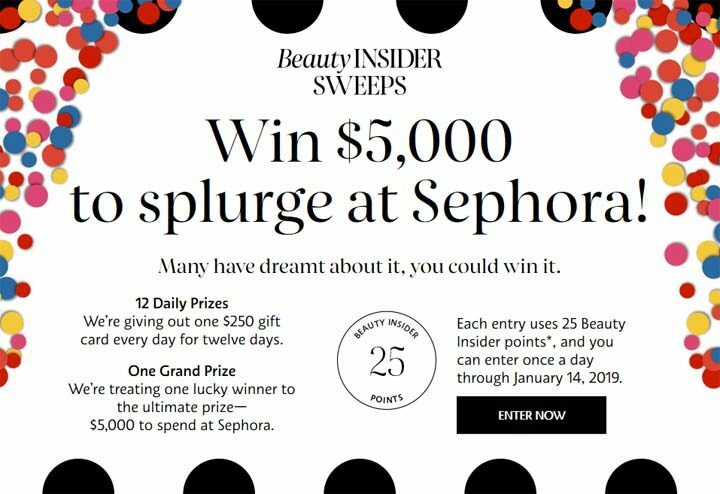 The Sephora Beauty Insiders Sweepstakes ends on January 14 at 11:59 p.m. PT. During the Promotion Period, visit beautyinsidersweeps.com and follow the links and instructions to redeem twenty five (25) Beauty Insider Points to receive one (1) Sweepstakes entry into the applicable Daily Entry Period drawing and one (1) Sweepstakes entry into the Grand Prize drawing. A $5,000 Sephora Gift Card. Approximate Retail Value (“ARV”): $5,000. A $250 Sephora Gift Card. ARV: $250. Total ARV of all prizes: $8,000.